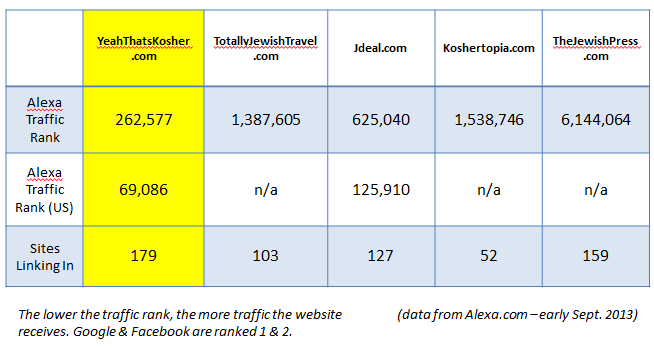 YeahThatsKosher.com is the #1 destination on the web for Kosher observant travelers – receiving between 20-30,000 hits a month. Passover content is the most searched for and visited content category on our site. As the #1 ranked online destination for Kosher travelers, YeahThatsKosher.com has the best tools for reaching thousands of affluent Jewish travelers online and through social media all winter long, from Sukkot to Passover. Not only do we provide a free online listing in our Passover Program 2014 Directory, you can stand out from the crowd with our affordable, custom-designed sponsored posts, directory upgrades and social media options. With 30,000 hits a month, 13,000+ social followers, and top Google ranks for Passover Travel searches, reach the next generation of Passover travelers through YeahThatsKosher.com. FULL PROGRAM LISTING – This option allows programs to add full descriptions, images, links, and other media to their listing in our Passover Program Directory. PROMOTED LISTING – This option “promotes” or bumps a listing to the top of the directory list. A link to the listing also appears on the YeahThatsKosher.com homepage, prominently on the right hand side. PROMOTED POST – This option offers programs and businesses the opportunity to be front and center before the entire YeahThatsKosher.com audience. A Sponsored Post is a blog post on the homepage of our site, that remains as the top post for 7 days, and gets promoted to our large following on Facebook, Twitter, and email list. If interested in promoting your Passover program on YeahThatsKosher.com, please email Dani@YeahThatsKosher.com.